The FurReal Friends toy line has been a smash hit ever since it was released. This year, for the Christmas 2014 season, the Get Up and GoGo My Walkin Pup is going to be the one all boys and girls ask Santa for when they hop up onto his lap. This is a toy that's great for kids who beg for a dog, but parents who don't yet want them to try taking on that kind of responsibility. It's lifelike, but not overwhelming. When your child takes her out of the box and names her, that's when the fun really begins. Using four AA batteries (which are not included), she comes to life and starts barking and making precious doggie noises. 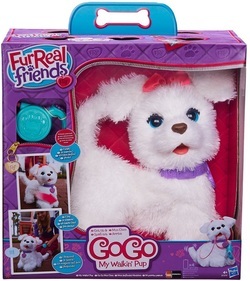 Your FurReal Friends Get Up and GoGo My Walkin Pup sounds just like a young puppy, and she's active, too! Your child can put her on a leash and walk her around. The leash has a built in remote control. Just like most toys this year, playtime isn't limited to the offline world. It's also set up to work in conjunction with a free iOS or Android App called FurReal Friends that your child can download. With the app, your little one can create delicious meals for her new four legged friend. Or, she can give the dog a bubble bath - without the offline mess it would create if you put a new real puppy in the bath. This Hasbro toy is very plush - so she's soft and fun to snuggle with. As she interacts with your child, she not only barks and walks, but she does other fun things, too! She wags her tail and she can sit. You know how a dog tilts their head to the side when you speak to them? Well, this toy does that, too! With blue eyes, a purple colour and a pink bow, she's a perfect toy for girls ages 4 and up, depending on when they lose interest in plush toys that interact with them. Parents have said this toy is very lifelike, so your kids will love it. They don't even have to use the leash - clapping your hands has the same effect to get it to walk. It moves perfectly on wood, tile or carpet floors - and if your child forgets to turn it off, that's no problem - because it shuts off automatically so battery life isn't wasted.